Research and Policy Brief: Residential property ownership in Gauteng - 10th December 2010. Property ownership is a key part of any free and open society. Property is also a source of income, equity, and savings for many households. Yet available data suggests that relatively few households in Gauteng, even those earning relatively high salaries, may ever come to finance and own their own home. This paper produces a rough estimate of how many households in Gauteng can afford to finance and therefore own residential property. Thirty two percent of Gauteng households earn less than R42 000 a year. Falling below this earning threshold qualifies a household for a fully subsidized government home. In recent years, both government and financial institutions have identified what is referred to as the ‘gap market’. There are households thatearn more than R42 000 a year but do not earn enough to qualify for a bond for the type of housing they could would want to live in. Alternatively there may be a shortage of housing in the price bracket these households can afford. According to research conducted by some leading financial services firms potential buyers earning up to R15 000-R16 000 a month, or approximately R190 000 a year, may also find it difficult to obtain appropriate mortgage financing to purchase residential property. First time buyers or those that do not own property, face a particularly difficult time because they have little equity and savings. The ‘gap market’ may therefore be best defined as those households earning between R42 000 and R190 000 a year. 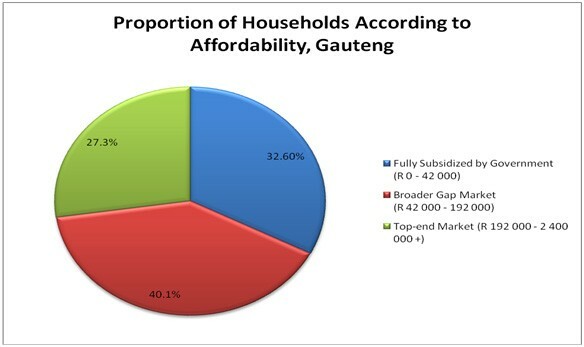 Graphic One below shows that in Gauteng this definition of the ‘gap market’ accounts for approximately 40% of all households. In real numbers, it means that approximately 1.3 million households will find it difficult to own residential property. These are households who earn an income, in some cases relatively high income by South Africans standards, but who may none the less not be able to buy a home. The table below illustrates this problem by examining the maximum mortgage loan that can be attained at different income levels and varying interest rates according to one of South Africa’s leading lending agencies. For example a household earning R5 000 a month, well in excess of the R42 000 a year to qualify for a housing subsidy, would qualify for a maximum installment of R1 500 a month at an interest rate of 10%. That would in turn qualify them for a home loan of just over R155 000. A household earning R15 000 a month, at the top end of the gap market, would qualify for a maximum home loan of just under R500 000. The question that follows is what property is there in Gauteng that falls within the R155 000 to R500 00 bracket? Our limited research suggested that with a R200 000 bond, a two bedroom and two bathroom Hillbrow flat could be affordable. About R300 000 could possibly acquire a one bedroom, one bathroom flat in Randburg or on the East Rand and some R420 000 could buy a two bedroom, one bathroom complex in Midrand. A great many areas of Gauteng, such as most of that area of Johannesburg enclosed by the N3 highway on the East and the N1 on the North and West would be unaffordable to this income bracket. Therefore in Gauteng, South Africa’s industrial and commercial centre, roughly only 40% of households earn enough to be fairly certain of being able to find an affordable home to buy. This figure may have some quite significant social implications. If home ownership is part of the make-up of a stable middle class then South Africa may struggle to fully establish such a class. Secondly, if homeownership is an important mechanism by which different generations are able to transfer wealth and equity to each other than very few future South African generations are likely to benefit from these transfers. Thirdly home loans may be a important forced savings mechanism for many households allowing them to build up a wealth and equity base. To its credit South Africa’s Government has recognised the need to assist households earning up to up to R180 000 per annum. A guarantee fund has been set up to incentivise the private banking and housing sector to build and finance residential housing that would meet the affordability criteria of these households. Transfer fees on properties traded at under R500 000 have been done away with. Certain financial services institutions have established lending products targeted at those households earning less than R180 000 a year. These are all welcome interventions. However in the long term significant economic and incomes growth will be necessary to ensure that more households are able to finance and thereby own their own property.